Winter Solstice Peace Crane. 2012. 17 ft. wingspan, 12 ft. long, 8 ft. tall. Baltic birch plywood, hardwoods, hammered copper "olive branch." 2012. Baltic birch plywood, hardwoods, other mixed media. Various sizes. 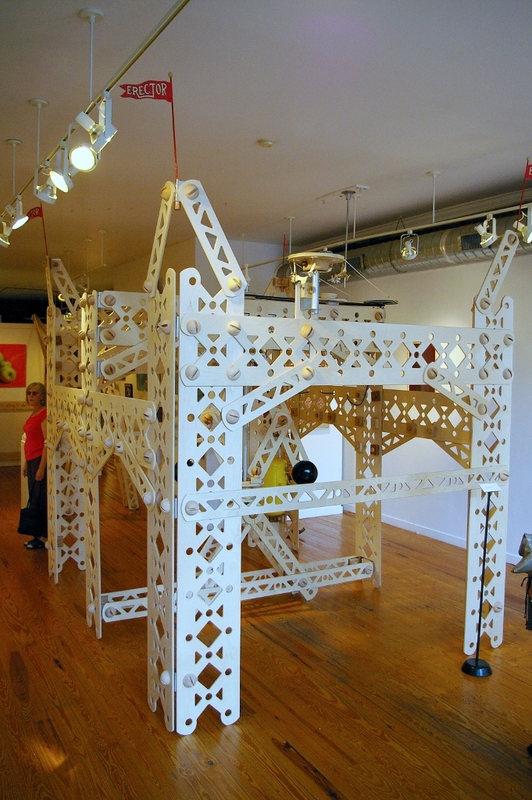 Homage to A.C. Gilbert, 2012 was created as if the 1960's Erector Set toy was full scale, 10 times the size of the original. This piece was the first of my “Maxiature Series” of common objects in uncommon sizes. 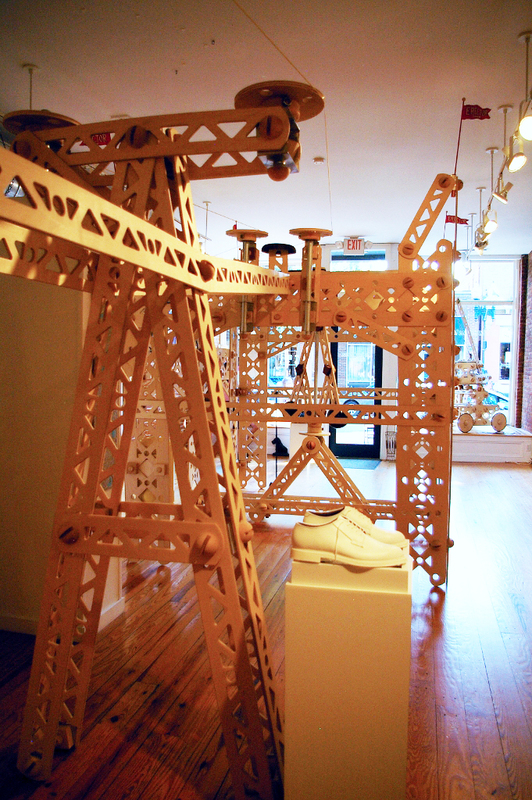 The entire "set" of life-sized Erector Set pieces comprises girders of high-grade Baltic birch plywood between 16” and 8 feet in two different widths, nuts and bolts, stainless steel angle brackets, wheels, belts, and other unique accessory pieces and currently contains more than 1200 items. Winter Solstice Peace Crane. Flying on 12/21/12 in Albany, NY. Photo by Albert Gnidica. Crossroads of Imagination. One-day installation for the MoHu Fest opening cocktail party fundraiser, October 4, 2012. 44 ft X 44 ft X 22 ft high. Baltic birch plywood, hardwoods, other mixed media. The sculpture was professionally lighted by Nick "Nicky Lightz" Nealon. Trojan Horse. 2013. Baltic birch plywood, copper, leather, stainless steel and other mixed media. Each girder was sanded and cut using a CNC machine, and then the edges were individually rounded. They remain unfinished to intentionally reflect the wear and tear of repeated play through installations.The stainless-steel brackets were custom designed by the artist and manufactured by a local metal working shop. 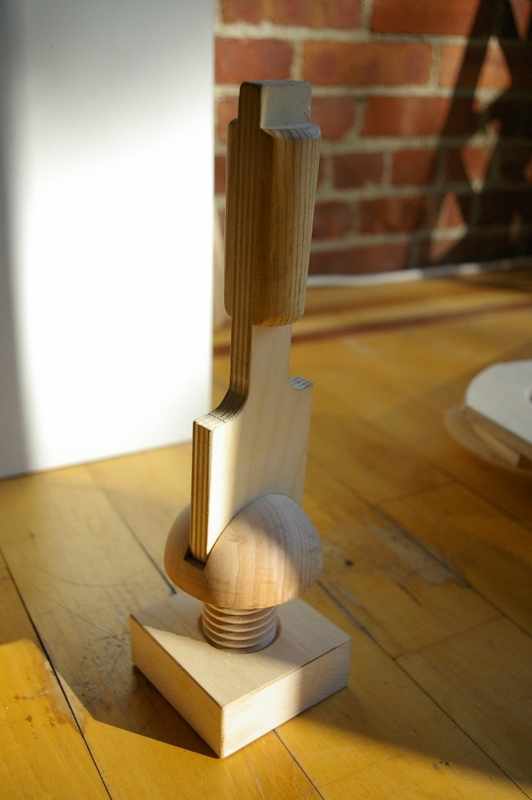 There are over 400 threaded round-headed wooden nuts and bolts. It has been assembled in more than 30 times in dozens of places. Beyond the towers and bridges imagined by Mr. Gilbert I saw possibilities of building ghostly silhouettes of iconic structures built within the structural limits of the "toy". It becomes easy for adults to regress into that long-forgotten childhood around my work as they can walk through and turn the crank of a do-nothing machine of a toy. It was the kind of toy that mattered less what it did than that it did anything at all. The process of developing my Erector Set-based sculpture caused me to spend a great deal of time thinking about the nature of how I played as a child and how I play now. Countless books have been written about the nature of play: how learning is affected, relationships are formed, and roles defined. Entire educational strategies have been successfully implemented based on the concept of learning by playing with shapes and forms. The physical nature of manually manipulating objects, as opposed to virtually moving objects on a video screen, cements a clear neural connection that is difficult to break and will only diminish in strength by lack of repetitive use. The complexity of learning manual skills through the physical process is abundantly clear when faced with a task such as learning to play guitar. The power of play is directly proportional to the quality of the toys. Toys that control the fantasy with books and cartoon characters that dictate the play scenario discourage the creative process within the human brain. The more a toy can be a prop to the stage play in the child's mind, the better the story can evolve. But I see another aspect of the nature of play which is not mentioned in academic circles. As children we are brought up in a world that is much out of scale to our little bodies. Chairs are huge hurdles to climb onto, crib sides that are eventually scaled are daunting and looking up to the lofty heights of adults is like seeing giants. But as children grow and scale changes until maturity, we are farther away from remembering those experiences. A C Gilbert had it so right in his advertising of the Erector Set. The pictures of the young boys and girls invariably show them building and playing with their creations. The fresh happy faces of children building bridges, cranes and Ferris wheels are portrayed as reflections of their pride at creating objects using hundreds of small parts, but the pictures of the toys that they have built are way out of proportion to the children. The bridge seems to span twenty feet and shows the boys sitting on the structure. The tower next to its builder is at least twice as large as the reality of what was possible with the actual size of its components. These images are not attempting to misrepresent the product but do represent the child's ability to project themselves mentally into the scale of whatever they are playing with. We might all remember the towers and slides we built with wood blocks, different every time and the sense of power achieved by demolishing them. I recall being able to imagine myself sitting in the seat of the Tonka truck loading sand into the dump truck which I then mentally jumped into to drive it to its destination. I knew that the engineering wonders that I created with my Erector Set were magnificent structures and machines that would bring awe to all who saw them. As a teen, I made wharf side miniatures with boathouses, docks and water that would not have been as detailed if I weren't able to shrink myself down to the same scale in my mind. I think that, for many adults, the need to maintain that sense of disproportion of scale is reflected by many who drive huge vehicles that resemble military assault trucks. Perhaps the need to build and live in one of those huge McMansions has come from those same roots of youthful disproportionate thinking. The sense of being master of your domain is quite like the sense of power and control gained by being able to create your unique surroundings no matter what size. To a child building a bridge to nowhere or playing with a dollhouse, the process is not dis-similar to being god. (S)he is in total control of the outcome of their miniature scenario and can create both dialogue and action relating to that process. I am almost embarrassed by how easy it is to regress into a child's perspective when it comes to my work. Children can immerse themselves so deeply into play that their perception of reality is altered. What boy or girl wasn't able to transport themselves into the seat of that Tonka truck or front end loader in their sandbox? What mental images of storybook characters or literary heroes were imagined by the young in their own reading? 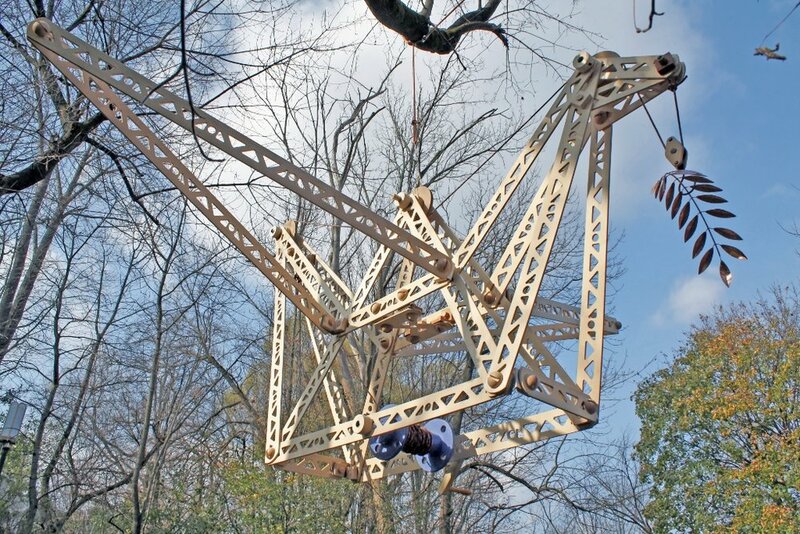 These factors were all part of the inspiration for creating a life size Erector set.